The original K'NEX box is not included. We understand that part of the experience of building a set relies on the exceptional manual LEGO produces. The set does not include any extra pieces or a disassembly tool. Collect your favorite characters from Plants vs. Zombies! Collect all 8! Which one will you get?., Collect all 8! 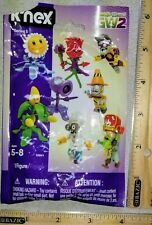 Series 5 includes the following characters- Super Brainz, Captain Sharkbite, Pylon Imp, Scientist, Plasma Peashooter, Power Flower, Rose, and Kernel Corn. Build your favorite Super Mario characters! Which one will you get?. Luigi's Mansion ! Number of accessories: 1. Grave Digger and Maximum Destruction truck pieces. 1 with one underline - Super Brains - rare. Note that the top left corner of the bag is missing, but the bag seal is still intact. 0 with two underlines - Sunflower - common. 0 with one underline - Kernel Corn - common. 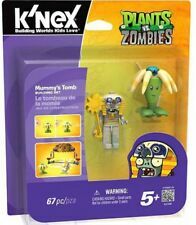 Includes special parts – this set includes specially designed parts that are only found in kid K'NEX sets. Let your child build cool K'NEX Buddies with stretchable necks and curly tails! 23 COLORFUL PIECES – The K'NEX Stretching' Friends Building Set includes 23 vibrant pieces that are perfect for your young ones. These items are new! You get 40 packs in this lot! Thanks for looking! Small lot of 9 pieces granite 2 position connectors. See photo gallery for the actual connectors you will receive. Collect your favorite characters from Plants vs. Zombies! Collect all 8! Which one will you get?., Collect all 8! 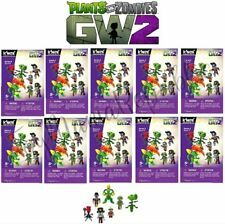 Series 4 includes the following characters- Soldier, Captain Deadbeard, Citron, Imp, Kernel Corn, Peashooter, Rose, and Super Brainz.Who will you get?. Great shape Used complete set counted. K'NEX Super Value Building Bricks Tub with 521. Convenient storage tub to hold even more K'NEX pieces. Winter Sale Price Reduced. Ideas for 35 unique models for open building fun! New, unopened. Used set, did not count, whats in pics is what you will receive. Please ask any questions. New in the box. Please see photos for details. IT IS 100% COMPLETE WITH226 PCS. THE MOTOR HAS BEEN TESTED AND RUNS GREAT. IT IS DATED2008. ORIGIN:--- MADE BY K'NEX. DATE:--- 2008 ---. THE SET IS COMPLETE. The Original Lincoln Logs ~ Real Wood ~. Includes 2 horses. Huge Lot About 100 Pieces. Knex clockwork roller coaster. Model 15406. Motorized clock arm coaster car lift. Building construction set. This set is complete with the pieces still sealed in the original bags. Includes all pieces, manual, stickers and original packaging. The packaging is dented and creased. (2) Avoid potential adverse reactions to certain chemicals by any little ones playing with the toys. 1) Avoid damaging paint or material on the item. I do this for two reasons;. 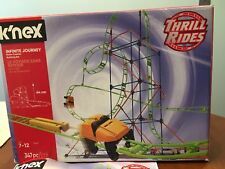 Tick, Tock goes the coaster car on the Clock Work Roller Coaster Building Set, from K'NEX. Includes 305 K'NEX parts and pieces. Motorized hour hand inspired coaster car lift. K'NEX Nintendo Super Mario Bros Mystery Series 10 Purple Toad. NEW Sealed Bag. K'NEX Nintendo Super Mario Bros Mystery Series 10 Red Mario. NEW Sealed Bag. Mario Kart Wii K'nex Luigi Figure Star & Mushroom Trophies Nintendo 2011 Replacement Parts. Good pre-owned condition. Please see pictures as they are part of the description. Knex Speed Coaster Set #2 12082/3263 428 Pcs Complete! Motorized Motor Kit K'NEX. Condition: This set is complete and in excellent condition. 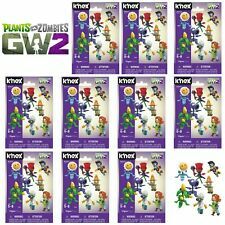 Knex Plants Vs Zombies Jetpack Zombie Attack Building Set 215 Pc Ages 5 53440 Building Worlds Kids Love 2014 Pop Cap Electronic Arts Inc. Condition Is New. Monster Jam Monster Mutt vs El Toro Loco K'nex Micro Scale Blocks Set BRAND NEW. Condition is New. Box has Scuffs and scratches Shipped with USPS Priority Mail. Original 2002 Wood Lincoln Logs Frontier Explorer Set "Classic Toys". This is the "Frontier Explorer" 100 Piece Set. I counted the pieces and they come to 100 exactly. This set is in very nice, clean, cared for condition. There is some wear to the container around the lid area.